The historical core of Sidon is a Mamluk-era old city that extends between the Sea Castle and the Saint Louis Castle. Located on a promontory jutting into the sea, this walled medieval city is very well preserved and is still inhabited today. The old City resembles a vaulted maze with narrow alleyways and winding streets. Arched pathways connect the different neighborhoods of the city. On street level, numerous souvenir shops and mini-markets can be found with old-fashioned bakeries making crunchy whole wheat bread, called "Kaak". 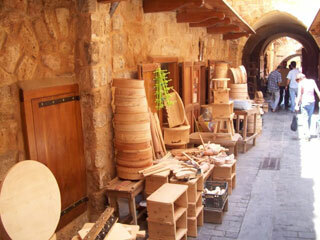 A lot of the alleys take the name of their residents' occupations like the "Carpenters' Alley" and the "Tailors' Alley". This article uses material from the Wikipedia article "Sidon Old Town", which is released under the Creative Commons Attribution-Share-Alike 3.0 License.